2. Pour your bag of chocolate melts in a microwave safe bowl, heat on 50% power for 2 to 3 minutes, stirring every 30 seconds until melted. 3. Pour your white chocolate onto the center of your lined cookie sheet and spread evenly with a spatula or the back of a spoon. 4. Place your groups of red M&M’s in groups of three all over your melted chocolate to look like Mickey Mouse. 5. Sprinkle a couple tablespoons of your Mickey Mouse sprinkles and red and white sprinkles onto your melted chocolate. 6. Place a few yellow M&M’s randomly all over your melted chocolate. 7. Place in the freezer for about 15 minutes or until bark is hardened. 8. Break apart in as big or small of pieces as you’d like. 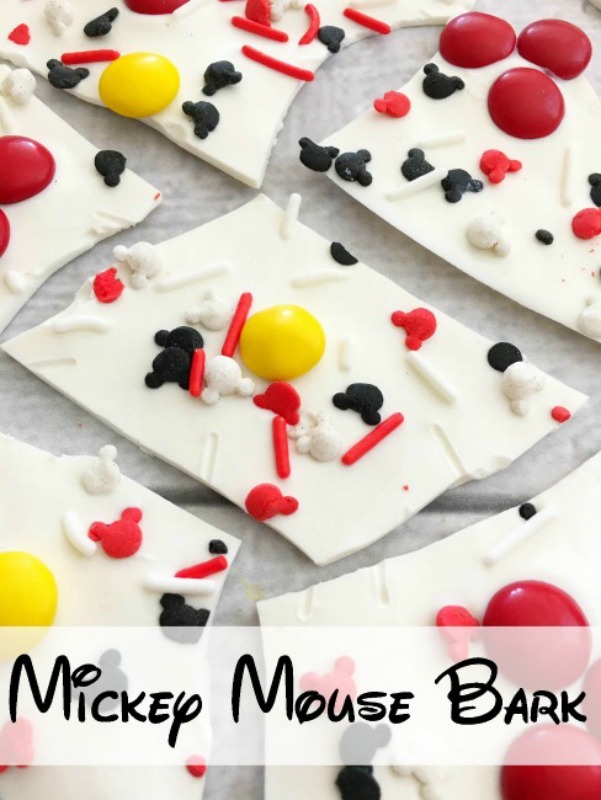 This Mickey Mouse Bark recipe is perfect for your favorite Disney fan! Hope you enjoy this Mickey Mouse Bark as much as my family did! What a lovely idea for Micky fans. I know my kids would love these. I need to track down some candy melts and Micky sprinkles and give this a go. My daughter will love this. We’re huge Disney fans. We go back to Disney World in June and cannot wait. This would be the perfect snack for that. That is SO cute! I think I will be making this before our next Disney trip! I love all the colors and how Disney it really looks! What a great treat for a Disney/Mickey Mouse-themed party! IT looks fairly easy to make as well as a lot of fun to eat! I love how you invisioned this great treat and made it so easily. I know it is not that easy but sooner or later I will try this and the kids will really like it. OK now this is absolutely fab! I have never made bark but it is something I keep thinking about I like the idea of making it mickey mouse style. I love making barks! They’re so easily customized for whatever kind of party you’re having. This Mickey Mouse idea is so sweet. Bark is so easy to make and there are some many decorating options. For the mickey mouse lovers this is fun and perfect. One of my friends is planning a Mickey Mouse Clubhouse themed party for their kid. I need to send them this post for a cute dessert. This is so cute and a fun way to celebrate Mickey Mouse. Or even to surprise the kids with a trip by giving them some bark! 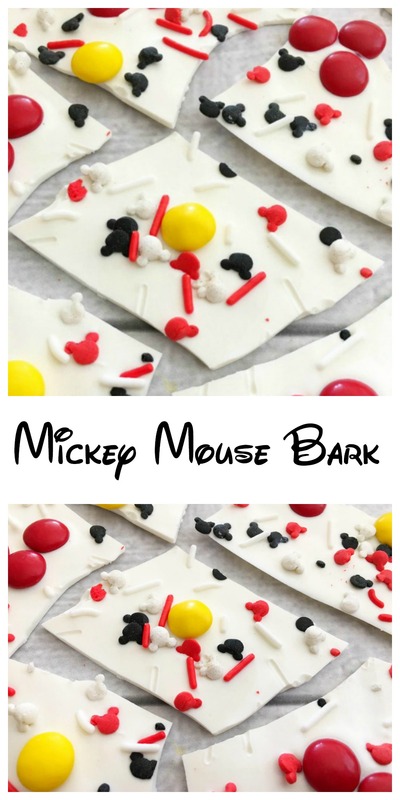 How fun is this Mickey Mouse bark! My niece would just love it. Maybe I’ll surprise her with it next weekend. My nephew is a huge Mickey fan and dressed up as his favorite mouse for Halloween. I’ll have to share this with them! This bark is so cute! I know my kiddos would love it!! Stop it!! That is so cute! I grew up in a town that was Mickey Mouse driven, so this would be such a fun thing to do when I go back to visit. We are such fans of bark. I love that Mickey makes an appearance in this one! This is so cute! I am definitely sharing it with my friend who is a Disney fanatic. This is really a cute idea! I love it! As a rule, having asked a question of installation of a ladder in the house, owners don’t assume that the ladder and its protection are two absolutely different products. Well, if the same company, like us, is engaged in the arrangement of turnkey facilities and can offer to make a ladder and metal fences on it in one set, but in practice it is rare. Now that some tasty and attractive treat! I am sure any kid would love a bite of those. That would be a fun dessert idea to hand out to the kiddos when you surprise them with a Disney trip! Oh my gosh, this bark is just adorable and making me want to go to Disney! Love that the color scheme is exactly like Mickey’s shorts! Oh my goodness I love this! It’s so adorable! My family would love these. This would be so much fun to make together this weekend. Those barks are adorable! Kids would love those. And I bet they taste good too. Why is this so cute! I’d love to make this with my niece. I am sure she will put a lot of sprinkle. haha! I just love entertaining people, and the way that I do that is through writing my blog and making videos! The more people who watch/read, the more people who might laugh or at least smile! That’s my goal! I tend to get a little irked when I feel like my traffic isn’t increasing much, but honestly, slow and steady wins the race and I do love my return readers/watchers! I appreciate them so much! Oh my..bring it on! We love Disney sooo much and Mickey Mouse has been a permanent additional member of our family, followed by more characters afterwards. The bark is super cute!